So this is my mom’s recipe for rice salad. Delicious and simple. I hesitate to even call it a recipe because you don’t really do anything but chop things up and mix things up and refrain from eating all the bacon. If you can wield a knife without chopping off your own fingers or those of anyone else, you can do this. -Note: This is an extremely customizable recipe. When I say a whole pound of bacon, I mean 15 or so slices. If you don’t want to die of a heart attack in the next week, feel free to reduce it. Same with the onions. Four might be a little heavy for some people. I don’t know. Just follow your heart! Click on the picture to see it full-size. 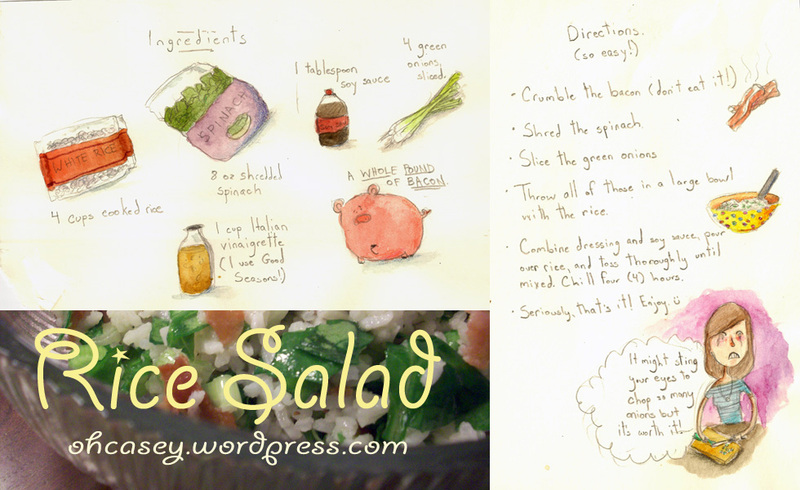 This entry was posted in Art, food, recipes and tagged art, illustration, recipes, salad by Casey. Bookmark the permalink.